Are you the type of person who enjoys taking long uninterrupted baths to relax? Us too, but there's no reason the bathtub should be where your comfort ends, so we designed a caddy that soothes your nerves wherever you go. Netflix and Tub? We have phone and tablet docks for hours of blissful binging. Gotta send a work e-mail from bed? Fold the lid flat and plop your laptop right on top! Wine and cheese party for one? We won't tell. However you choose to let life's troubles melt away, Bambuloo is here to help. 1. Fully Extendable Design to Fit Any Bathtub up to 39 inches wide. 2. Foldable Flip-Out Legs that Extend for Use in Any Room in the House. 2. Two (2) FREE Lavender Bath Bombs Included as our GIFT to You. 3. Magnetic Locking Backstop to Hold iPads, Tablets, Books, Magazines, and Newspapers. 4. Dedicated Built-in iPhone/Smartphone Dock to Securely Hold Your Electronics. 5. Spill-Proof Wine Glass Holder. 6. Cup and Candle Holder to Set the Mood. 7. Hand Towel and Accessories Tray. 9. Breathable Design to Prevent MOLD. 10. Made Entirely from Eco-Friendly Bamboo. 11. Buy with Peace of Mind Using Our 100% Satisfaction Money Back Guarantee. 1. Wipe dry after use with a clean cloth. Do not soak the caddy. 2. Maximum weight capacity: 15 lbs. 3. Never plug in electronics around water. You have several options when it comes to making your caddy choice and so we built a company totally dedicated to making sure we deliver the highest quality products. We promise you will love your caddy, so buy with peace of mind knowing you are backed by our 100% satisfaction guarantee. Click the "Add to Cart" Button Now and Receive TWO (2) Free Bath Bombs as Our Gift To You! LUXURIOUS SPA EXPERIENCE - Slide into the warm and aromatic embrace of a soothing bath with wine in one hand and a flickering candle to set the mood - all while binge watching your favorite Netflix show. Our 12-in-1 caddy allows you to transform any bathroom into your dream resort spa. PERFECT GIFT - Relaxation is vital to your well-being so why not get more joy out of every room in the house? With flip-out extendable legs, our caddy goes with you whether it's breakfast in bed, coffee on your couch, or partying by the poolside. HANDCRAFTED - Poor quality can be a royal pain in the tub. If you're looking for a cheap solution that has smelly fabric backings, cracked wood, and grows mold then our caddy isn't for you. We are proud to sell only the highest quality items that we feature in our own homes. LUSH FIZZING & FUN: Our BONUS lavender bath bombs create longer-lasting perfuming effects to give you a soothing & spa-level experience with a natural aromatic bath at the same time. Two (2) bath bombs are our gift to you with each caddy. CERTAIN SATISFACTION - We're only happy if you are. Life is too short to stress over returns, so buy now with peace of mind knowing you are backed by our no questions asked 100% satisfaction guarantee. 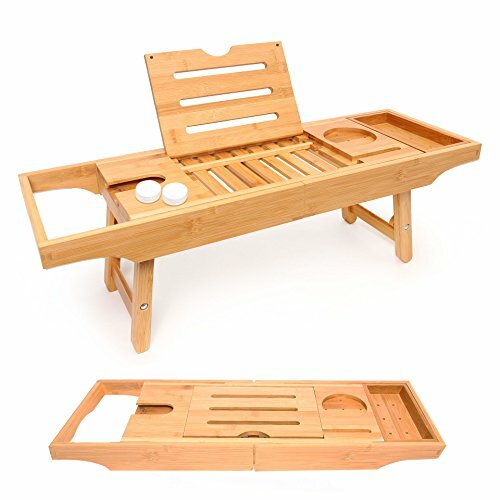 Choose this eco-friendly, natural bamboo caddy and by this time tomorrow you could be enjoying the home spa experience of a lifetime. If you have any questions about this product by Bambuloo, contact us by completing and submitting the form below. If you are looking for a specif part number, please include it with your message.